For the 2016 Feis Ile festival, Bunnahabhain bottled two special releases as distillery exclusives for those who made the trip to Islay and the northern end of island. I was fortunate to be on the island as part of the Bunnhabhain Day Tripper 2016 package which was a hassle free option for those unable to visit Islay for a longer period; accommodation can be pricey if you don't fancy a tent! It was the first time that Bunnahabhain had put together this concept and I hope that they'll continue to do so. Speaking to attendees on the coach back to Glasgow, everyone had a great time and would certainly do it again. 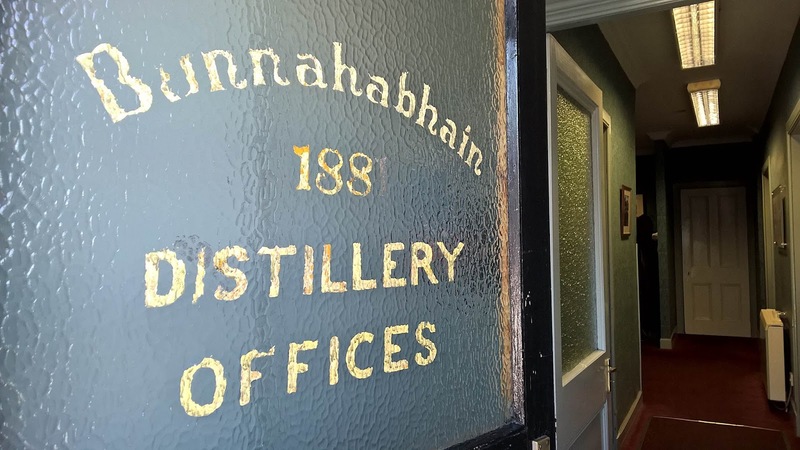 Slickly organised and with plenty of Bunnahabhain - it almost felt as if it was on tap during the day out - meals provided and plenty of banter from strangers and the excellent staff, what looked like an epic trip on paper was relatively comfortable. I know the Bunnahabhain 12 pretty well now to say the least and that'll be reviewed soon enough. I'll be writing up the day and a couple of the tours later this week but for now what about this Amontillado bottling? Of the two for the festival this 16 year old is the high end release at £250 and the asking price matches the limited out-turn of just 250 bottles. If you had said Amontillado to me prior to this bottling then I would have immediately thought of the 10 year old Deanston Amontillado release that has been appreciated by visitors to my home. Plus a few friends who have then sought out the bottling for themselves. A byproduct of being a whisky enthusiast is slowly learning about the various types of sherry casks available. Amontillado commences life as a Fino sherry, but if the wine yeast fails to have the necessary impact its then reclassified and refortified. The casks is then left for a longer period of maturation than a typical Fino. The end result is a type of sherry beyond the original target of Fino and verging on the coattails of Oloroso sherry. Sherry class over, its time for the whisky itself. I had high expectations of this one given my Deanston experience previously. Feis Ile bottlings always command a premium and given the amount of flipping that goes on, I can appreciate why the price is set at £250 by the distillery. It is after all a single cask out-turn of 250 and won't be around for long. This comes from a generous sample poured by the distillery manager in the oldest warehouse at the distillery. I wanted to sit down appreciate this one at home without any Bunnahabhain 12 influence! Initially matured for a decade in bourbon casks it then spent the last 6 years in the Amontillado cask before being bottled un-chillfiltered and natural colour at 54.6% vol. Nose: candied oranges is my first impression almost Irn Bru-like in the sweetness and barley sweets. Light brown sugar and ginger with freshly grated carrots and a honey glaze. Pink peppercorns, red berries and dried cranberries with a whiff of roasted coffee beans. With water cinnamon and all-spice arise. Taste: very balanced on the palate with lots of creamy sherry infusion and walnuts. Smoked orange peel, honeycomb, grapefruit and fresh ginger. With water toffee or Werther's Original with plenty of cream. Overall: I didn't pick up a bottle of this after my Speyside Festival exploits last month, its all been a little expensive lets say. However given the opportunity now I certainly would as this is extremely drinkable and enjoyable. I'm sure with a bottle I could dig into the palate more. Still, I did purchase a bottle of the other Bunnahabhain Feis Ile release; namely the Moine PX 12 year old so expect a review later this week of the £95 edition.